Tim Shaw has three degrees in glassblowing. After attaining his BA (Hons) from North Staffordshire Polytechnic in the early 80’s, he went on to study at the avant-garde Gerrit Rietveld Academie in Amsterdam where he continued to develop and experiment, creating a unique style of art glass. Upon his return to the UK, he established a hot glass workshop in London. Tim’s creative talent was recognized by his peers, and he was invited to undertake his second MA at the prestigious Royal College of Art in London. 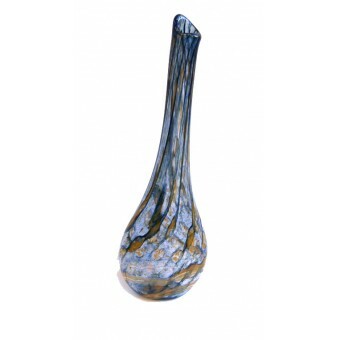 Here he further refined and honed his glassmaking skills, whilst pushing the boundaries of his artistic expression. For the past 12 years Tim has resided in Australia. His studio is nestled amongst the Stringybark forests of the beautiful Adelaide Hills. In this idyllic setting, Tim’s work has flourished, absorbing Australian influences. This inspiration is most marked through his use of vibrant colour and striking forms. Tim’s pleasure in working with glass is evident to the viewer. His love of colour, decoration and texture fires the imagination.